The bullish trend for cryptocurrencies has ended now as BITCOIN has formed a resistance at $5,300 which seems too strong for buyers. Buyers ran into some resistance at $5,000 first during the initial $1,000 pip surge, but then pushed above it. Although, they couldn’t take out the $5,300 level and after a few attempts that level has now turned into solid resistance. The buyers managed to push above it and reach $5,435 on my platform but the price returned back down pretty quickly, so that piercing is not considered a proper break, since the H4 candlestick closed below resistance. The sellers became more confident after that failure and pushed down to the 50 SMA (yellow). 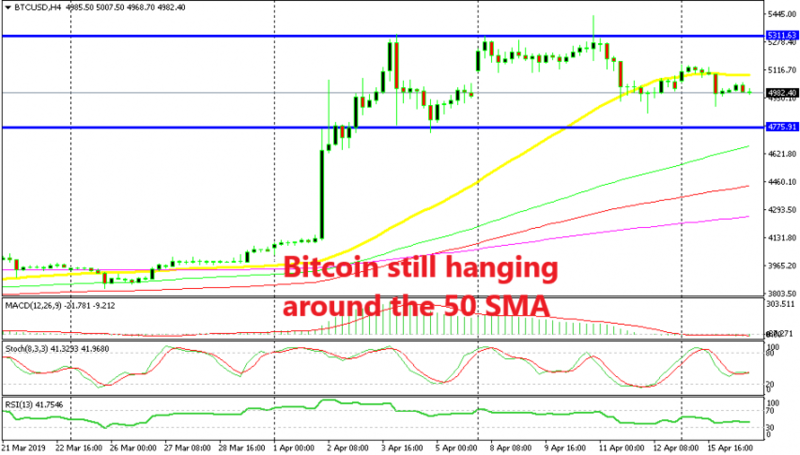 Bitcoin found support for some time at this moving average but pushed below it at the end of last week. Although, the sellers gave up quickly as they couldn’t push too far below the 50 SMA and couldn’t reach the bottom of the range. Now the price has moved above and below the 50 SMA for some time and is hanging around the $5,000 level. We’re in the middle of the range so there’s no real direction at the moment.